Minexcoin Celebrate their Third Week of being Officially Exchange Listed, and Announce a 900% Increase in Price Over that Time Frame, Seeing Recognition from CoinMarketCap as one of their "Biggest Gainers"
KOWLOON, HONG KONG / ACCESSWIRE / November 23, 2017 / About three weeks ago, Minexcoin was listed on exchanges and presented a Memorandum of the autonomous algorithm for volatility regulation, known as MinexBank. We took a second look at this project to see how's it going. In a matter of weeks, MNX managed to achieve a 9-fold increase in price, and got into the "Biggest Gainers" list on CoinMarketCap, and strengthened at the price of $11. Now, as developers explain, the algorithm is being calibrated and the control over volatility will be ensured after reaching a price of $20 per coin. For those who are looking for mid- and long-term investments, it would be useful to read the Memorandum again. While entirely recognizing our responsibility to reach the main goal of the Minexcoin project, namely, securing MNX with the status of reserve currency on cryptomarket, we at MINEXBANK would like to address you with this Memorandum. Provide an increasing exchange rate of MNX to USD upon reaching the above-mentioned rate by the end of 2017 on the basis of 42.7% annual growth. This level corresponds to average annual growth of market capitalization of the top 10 cryptocurrencies in 2016 – Q1 2017. The base annual parking rate of MNX will be reviewed every six months based on the assessment of changes occurring in the cryptocurrency market for the expired period. Based on the analysis of the growth rate of the cryptocurrency market for the last 6 months, the base annual parking rate is set at 85% now. Special reservation: During the three months from November 1, 2017, there will be a period of creation and development of the MNX exchange market. The market will be formed in stages due to different terms of trades launching on various exchanges. In addition, there will be a process of testing and debugging the algorithm of Minexbank's operation in real conditions (the development of a database and response tools). Therefore, deviations from the real macroeconomic parameters declared in the Memorandum are possible in the first three months. The total volume of preliminary MNX emission is 5 500 000 MNX. MINEXBANK's reserve is 1 500 000 MNX out of the above-mentioned amount. The developers' compensation is 1 000 000 MNX. Developers have decided not to bring their coins to the market until the end of 2017. Hence the net money supply is 3 000 000 MNX while MINEXBANK reserve is 50% out of the net money supply. This testifies to a high level of the Bank procedures' durability provided to stabilize the MNX market. We'd like to pay special attention of the MNX market participants to the following circumstance. MINEXBANK's activity will be aimed at keeping the MNX quotes to USD within the 5% range of fluctuations relative to the representing the estimated growth rate of 42.7% per annum from the rate of 20 USD/MNX. "Minex Systems Limited", a Hong Kong-registered company, specializes in blockchain product development. The company offers solutions which include the best of both the conventional financial system and cryptocurrency ecosystem, and works on the unified Minex Platform. 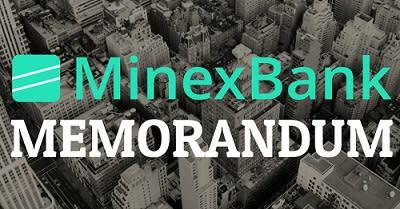 To date, the flagship product is an autonomous algorithm for controlling the volatility of MinexCoin named MinexBank.